Roberts has been teasing digital radio fans with its first hi-res touchscreen DAB radio, the Roberts ColourStream, for some time now, with a UK launch officially announced this week. 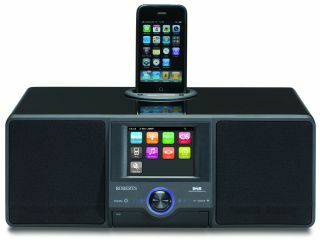 Roberts clearly hopes that its latest (and first) sound system with a colour touch display should launch just in time to maximise Christmas sales opportunities, with new digital radios and iPod docks being a popular present choice this coming Yule. The new ColourStream is set to cost £200, so it doesn't come cheap, but it does come with the hi-fi quality associated with the long-standing Roberts brand. "The colourSTREAM has an acoustically-tuned cabinet with high gloss piano black finish," reads the Roberts' release just in. "The large colour touchscreen gives easy control over all functions of the sound system, including DAB/FM and Wi-Fi radio, and there is an iPod dock." Roberts' chief exec Leslie Burrage, adds: "We have incorporated our attractive and intuitive new system into a strongly contemporary design to meet the demands of a technically demanding and performance-driven consumer." Internet radio is also covered off, with instant access to over 10,000 radio stations around the world, along with the option to stream your music directly from your PC, so you no longer have to put up with those awful tinny-sounding speakers on your laptop. ColourStream comes with 30 station presets and the option of a service from Last.fm. Stay tuned for a full review as soon as we get hold of a sample. For now, head to robertsradio.co.uk for more.